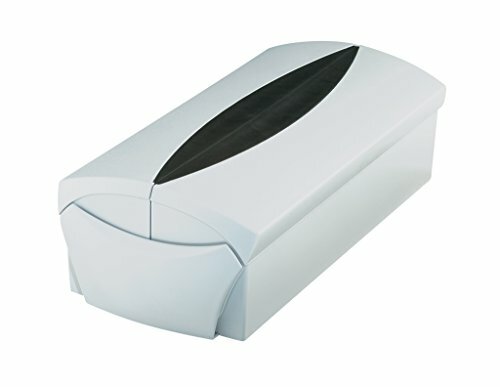 VIP Business card box, holds approx. 500 cards. Keep track of the essentials. Outstanding design. High-quality finish. The adjustable support plate ensures that they are kept in place: from small quantities to approx. 500 cards. Ideal for people on the move: business card case Go VIP, for approx. 20 cards. Clearly arranged due to the 16-part A-Z designer set of guide cards. Inspiring mechanism: gentle opening and closing - soft rubber insert for optimum ease of handling. Supplied with 16-part designer set of guide cards A - Z, adjustable support plate and business card case Go VIP (Item # 2001). Non-slip rubber furniture protectors ensure a firm grip. Design and colour match the style of all products of the DELTA range. Made in Germany. Material: high-quality plastic, polystyrene (PS). Outer dimensions (W x D x H): 120 x 245 x 80 mm. Colour: light-grey/black.